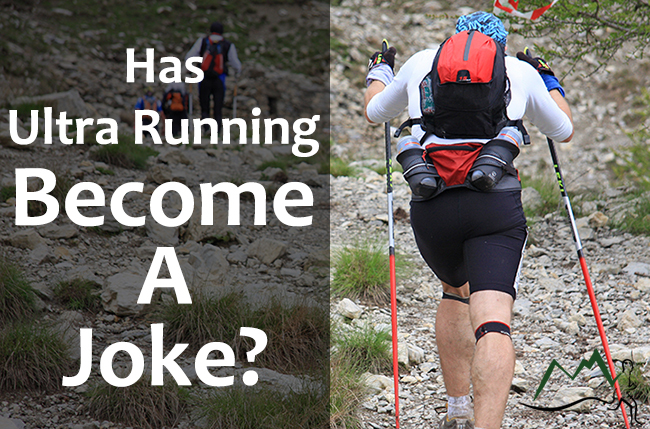 Has Ultra Running Become a Joke? A few nights ago I was checking my Twitter feed one last time before bed, when an article caught my eye. “This’ll be a funny,” I thought, and clicked on the link. But as I read the article and watched the video, I didn’t find it very funny. Instead, I got frustrated, then embarrassed, then a little mad. It was about Reza Baluchi, an ultrarunner who has run several extreme distances (like a complete loop around the perimeter of the United States), who set out to run over 1,000 miles from Florida to Bermuda…in a floating bubble. To raise awareness for world peace. His plan was to sleep in the bubble and live off energy bars. He had no boat accompanying him, and apparently had no good navigational tools. Just a few days in, he was flagging down boats to ask for directions. Before I go on, if you haven’t seen it, watch this video to catch up. To get a better idea of what this bubble looked like, you can check out videos like this one. If you read much news, you’ve probably already seen this story. Because it’s been popping up everywhere, including NBC, BBC, NPR, and CNN. Just about every major news organization out there. And while they don’t all share the same tone when covering the article, they all start with a similar lead in. Ultrarunner. When was the last time an ultrarunner was all over the mainstream media? I don’t have the answer to that question, but I do know it isn’t very often. But I don’t want to just talk about Reza. Instead I want to talk about something this media coverage brought to mind. A bigger trend that seems to be growing in popularity as ultrarunning also grows. When is Ultra Too Ultra? For most people, it hasn’t been that long since the marathon sounded like a near impossible achievement. When someone would run 26.2 miles, their friends and family were blown away. Nowadays, however, that’s no longer the case. Over half a million US runners finished a marathon in 2013 alone! I don’t want to downplay that achievement, but I think it’s fair to say that these days most people know at least someone who’s run a marathon. And that the once impossible distance no longer seems that impossible. So it’s only natural that people are pushing further. They want to see what other impossibles are actually possible. And they’re turning to ultras. That’s why I ran my first 50k, after all, and why I continue pushing further today. But more and more, these attempts of ultra-endurance impossible are getting increasingly…ridiculous. Allow me to explain. Natural distances, such as circumnavigating Mont Blanc or Lake Tahoe, or seeing how quickly you can climb a mountain and come back down. Trail lengths, such as Fastest Known Time (FKT) attempts of the Appalachian Trail, John Muir Trail, or the rim-to-rim-to-rim of the Grand Canyon. Common distances, which determine the length of most ultra races, like 50k, 50 mile, 100k, 100 mile, etc. These outings serve a purpose (or as much as any run could), and while most non-ultrarunners still don’t understand why we would want to do it, at least they can understand the appeal of discovering how fast you can travel the length of the Appalachian Trail, or cover 100 miles. But increasingly, I’m reading about endurance feats that make even the ultra-endurance lover in me question their purpose. Sure they might be incredible accomplishments, but what are they trying to prove? The Grand Canyon Rim-to-Rim Sextuple – Taking the popular rim-to-rim-to-rim run, and doing it three times. The Badwater Quad – Running the Badwater ultramarathon course there and back, twice, for a total of 584 miles to raise awareness of global water issues (great cause, of course). Running Around the World – The circumnavigation of the world. This would fall under the first category of running a natural distance, but let’s be real, you can’t run around the world. And it takes nearly two years to do it…so that just doesn’t qualify. And now, the newest and most ridiculous one of all, running from Florida to Bermuda in a bubble. I think it’s important to note that ultrarunning has always been a place for quirky events and runners. We crave the extremes and thrive off our unusual customs. That’s not what we’re talking about today. Because I’m all for adventure. And I’m all about finding new ways to push myself and the sport of ultrarunning to new limits. But when I read about these attempts, I have to wonder, are they actually hurting the sport? Running across the grand canyon six times might make for a nice headline, but what is it saying to the average runner looking to venture into ultrarunning? And how does it translate when I tell my non-running friends that I just signed up for another 100 miler? Do they just assume I’m running a nonsensical distance as well? Do they think that they’ll soon hear about me being rescued in a floating bubble? Do they consider ultra-distance running a joke? These attempts are dangerous, costly, and appear to be run more for the great headline than anything else. That’s why I get embarrassed when I read articles like the one about Reza. Because the vast majority of us aren’t out there trying to make headlines or scheming up a trip just because it’s the most outlandish thing we can think of. We’re training hard, challenging our minds, and testing what the human body is made of through races and adventures that just make sense. That’s what gets us running in the morning and keeps us running through the night when the doubt creeps in. Call for Comments: Do you think these adventures are hurting the sport or a good aspect of ultra-endurance running? conflating ras vaughan’s sextuple rim-to-rim with some dope in a bubble is unfair. i know ras; his adventures are meticulously planned, tracked, and documented. he undertakes them to challenge himself and see what is humanly possible. and the fact is, he doesn’t always succeed. but he’s out there on his own journey, celebrating life. he’s certainly not in it for the headlines. if his idea of an ultra-adventure doesn’t make sense to you, that’s cool. but don’t kid yourself that you’re not out there on the same continuum. you just haven’t traveled as far (yet) as ras has. cheers, brother. Hey Michael, Thanks for reading and sharing your thoughts. I don’t mean to put down Ras. I’ve loved hearing about some of his really inspiring and wonderful adventures, most recently his unsupported crossing of Washington State and Tahoe 200. And while I’ve never met the guy, I’m sure he’s pretty awesome (I mean, just look at him! He looks like someone I’d want to hang with). My point in adding in the sextuple to the list is that to me, it just doesn’t make sense. Why cross the canyon six times instead of say, run the length of the canyon. That’s all. But I guess we all draw different inspirations. Thanks again, and see you on the trails. I agree that some of these “adventures” are dumb — especially when the people trying them do with with no precautions or safety systems. At least with Diana Nyad’s swim from Cuba to Florida, she had a whole crew and safety net. However, I do think that you can’t easily define what is an adventure that “makes sense” or not. Is it just distance? For example, a 100 miles to you may seam reasonable but to many others it is ALSO “foolish” and doesn’t make sense. You’re right. It’s hard to define what “makes sense” and what doesn’t. I tried to share my definition in the post, but I’m seeing through comments (especially on Twitter) that not everyone agrees. And that’s ok! Look, I once thought RUNNING, period, was foolish. Then I became a runner. And I thought 26.2 miles was foolish. Then I ran NYC Marathon… So we all have different perspectives. I think my definition of foolish is attempting something nutso with apparently little concern for preparation and safety precautions. But even that is hard to define with precision. I like and admire Dean Karnazes a lot but you could certainly argue he has done a lot of “foolish” things and it is not clear why. But I still get inspired. For the record, I don’t running a 100-mile race in and of itself is foolish, but it would be foolish for ME to run one right now, at my level of skill and fitness. For the most part, on behalf of the sport of running, I see where you are coming from. I do however think that running has always been evolving from the beginning. I really believe it is about the bigger picture for that individual. If your running is defined by how much you can push yourself, which cause to raise awareness for, getting in the headlines or impressing friends with your distances, then have-atter. It’s obvious the human body is getting stronger. And if that’s the case, why try to stop it? Running shouldn’t only be about 26.2. In fact, I’ve stopped making it about the number, and instead have been trying to focus it more on what it can do for me. Great insight on it though. And congrats on your 50k!